Providing the ESSENTIALS to keep you pumping! Franklin Fueling Systems is on a tear at the moment as they launch new products and now a line of products under the Cable TightTM brand. The Cable TightTM wire management system boasts the ability to provide a true watertight end-to-end solution for electrical, sensor, and data wire management. Like Franklin’s UPP products, it is an electrofusion welding installation process that creates one seamless system from the HDPE-constructed electrical conduit, entry seals to sumps. Available in 3/4″ and 1″ in rolls of 1000′ and 1500′ coils, Cable TightTM ‘s highly durable and corrosion resistant materials won’t crack if bent, shatter if hit with a tool or stepped on in cold weather installations after it’s been laid out on a busy job site. Along with a plethora of configurations, options, tools and information, you’ll find everything you need to get the job done in nearly the same time it takes to install PVC conduit. 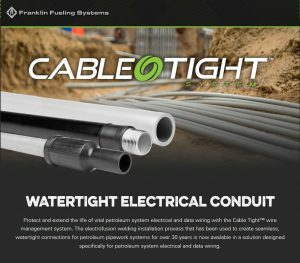 Franklin has not only created a Cable Tight System website that includes videos and downloads but you can also find Cable Tight under the new Wire Management section of the Franklin Fueling website. If you are interested in learning more or to place an order for the Cable TightTM System, please contact us at 1.800.451.4021. The John W. Kennedy Company appreciates your business and continued support! Universal Valve: Which Is Really Better – Cross-linked or Linear Polyethylene?